This entry was posted on April 9, 2010 at 12:05 PM and is filed under Shirts with tags Donald Trump Collection, French cuff. You can follow any responses to this entry through the RSS 2.0 feed. You can leave a response, or trackback from your own site. It’s more officious and self-possessed, that’s why! don’t think I can pull off the frenchies…though I am impressed with your suave style. I like the French cuffs, but my butch actually requires a more feminine cut– doesn’t like the extra bagginess men’s shirts give her when she tucks them in. Have you seen any in women’s shirts? I’d love to see her in one of these. Brooks Brothers has great women’s shirts with French Cuffs. French cuffs are my favorite type of button down. I prefer shirts without banker’s cuffs/collar. I like the more modern look of shirts with matching cuffs. 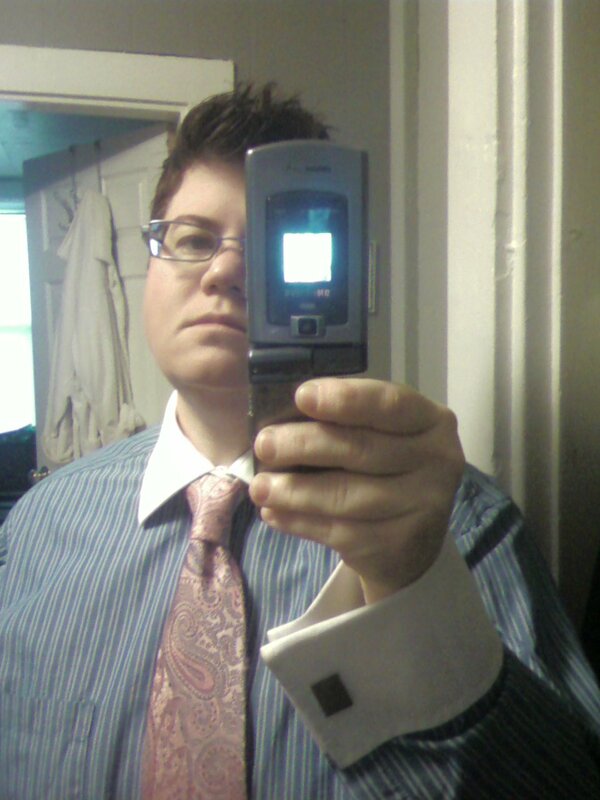 Bonus for shirts that require collar stays…love them! I have some french-cuffed shirts from Perry Ellis that I got at TJ Maxx–a place I’ve heard you’ve patronized. :p I don’t like the contrast color french cuffs for myself. I’m sure other brands offer this as well, but the PE shirts I found keep the same pattern/color of the arm for the cuff. T M Lewin. They do four different sleeve lengths and a choice of single or double cuffs on most shirts.